Started by Alaskans. Still owned by Alaskans. STEELFAB has been in business in the same location adjacent to Ship Creek in Anchorage since 1952. 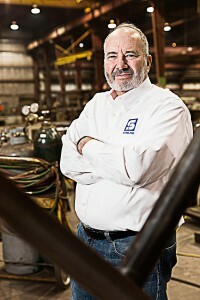 Richard and Janet Faulkner bought STEELFAB over 25 years ago and initiated an ambitious and intensive capital improvement campaign to thoroughly modernize and expand the original 8,000 square-feet, six-acre site. Today, STEELFAB encompasses 84,000 square-feet under roof with an additional 16,000 craned outside storage providing more than 100,000 square-feet of covered/craned working space on 10 acres of property. This provides for warehouse, fabrication, coating, shot blasting, six 10-ton and five 5-ton overhead cranes and processing activities inside featuring modern equipment like a computer-guided plasma burn table, shotblaster, four 1-ton lib cranes, a beam-fabrication machine and press brakes. STEELFAB also offers a 2 ½ acre module assembly area with in-ground beams for stacking, leveling and assembling multiple modules with in-ground power. A completely revamped storage and process system that includes improved plate handling and beam-storage capacities, plus indoor and outside industrial lighting, add to the modernized, safety-enhanced picture at STEELFAB. STEELFAB offers over 100,000 tons of steel products available year-round. Alaskans are a proud group of highly individual people. It is our nature, however, a few themes do unite us. A common one is recognizing when we can do a job without help from outside of Alaska. We are proud of the quality of work and fabricated steel products we produce at STEELFAB. As the largest integrated, locally owned steel company and Service Center, Fabricator and Coater in Alaska, with the largest volume capacity, we provide large and small products to the oil, construction, and other industries of our great state. Our goal is to make sure our customers never have to leave Alaska to get their steel needs met. We are confident we meet or exceed the capabilities of all other steel centers in Alaska and on the West Coast of America. And we mean to stay that way.